When I left you hanging in the manner of the Hardy Boys at the end of Part 1, you had suffered through a 4,000-word post just to eliminate the flotsam from this year’s Baseball Hall of Fame ballot. I had crossed out 19 of the 34 names, which still left 15 to share the 10 votes I’m allowed. So I’ve provided the shortcut above for those who just want the bottom line and aren’t up for another 5,000 words. If that’s you, there you go, and see you around. For the rest of you, masochists that you are, here we go. Starting pitcher: Randy Johnson, Pedro Martinez, Mike Mussina, Curt Schilling. Relief pitcher: Tom Gordon, Lee Smith. Second base: Craig Biggio, Jeff Kent. I began, as I did in Part 1, with Jay Jaffe’s JAWS system to get a feel for what the quants would say. The 15 candidates are listed in order, from best to worst, based on their premium or deficit to the average JAWS score of players at their position already enshrined in the Hall of Fame. As a reminder, JAWS is the average of a player’s career wins above replacement and that player’s “peak” WAR — the total of his best seven seasons. The theory, and I stress the word theory, is the perfect blend of longevity and awesomeness. Presumably, if you believed the JAWS method delivered on this theory, you would vote for the first 10 names on this list and be done with it, especially because the first 10, conveniently, are above the average of the players at their position already in the Hall, and the next five are below. The idea behind JAWS is to prevent dilution of the quality of players in the Hall by inducting only players equal or superior to the existing residents. Appraising the quantitatively-derived list with my subjective, qualitative eye, several anomalies jump out. Anomaly No. 1: Craig Biggio. Considered by most observers a lock for the Hall since the day he retired, Biggio, according to JAWS, was an inferior player to the average second baseman now in the Hall. He was the top vote-getter in his first year on the ballot, 2013, the year nobody was inducted, receiving 68.2 percent of the vote. Last year, leapfrogged by first-timers Greg Maddux, Tom Glavine and Frank Thomas, he received 427 votes from the 571 voters, or 74.8 percent. Had he received two more votes, he would have joined Maddux, Glavine and Thomas in the class of 2014. Significantly, Biggio’s JAWS score is inferior to that of Lou Whitaker, the under-appreciated longtime Tigers second baseman who failed to receive the minimum 5 percent required to stay on the ballot in his sole appearance in 2001. That, of course, is a crime against nature and baseball, as is the continuing under-appreciation of his teammate and double-play partner, Alan Trammell, on the ballot this year for the 14th time. But we’re getting ahead of ourselves. Prone as I am to stirring up trouble, and knowing the howls of outrage this would trigger among veteran members of the Baseball Writers Association of America, I might hypothesize that race had something to do with it — Whitaker is black, Biggio is white — and order up a quantitative analysis of voting on comparable players by race, and a parallel analysis of the racial makeup of the voting population. I don’t know what such a study might find on the first question, although I would note that Tony Gwynn and Frank Thomas sailed in a lot faster than some white comparables, and Jim Rice got in with a JAWS score lower than Minnie Minoso, Lance Berkman and Jose Cruz. On the second, my guess is the racial makeup of the voting population looks something like the racial makeup of Maine, New Hampshire and Vermont, which is why the hypothesis must be considered. Another hypothesis would be that the absence of a significant sabermetric influence in 2001 revealed an embarrassing blind spot in qualitative analysis. Whitaker’s offensive numbers in the traditional, non-sabermetric categories — .276/.363/.426, 244 homers, 1,084 RBI — while above average for a second baseman, were nowhere near the numbers generally required of hitters who played the corner positions or the outfield. And while he was known as a smooth fielder, few voters were probably aware this would translate into 15.4 defensive WAR. Given what’s happened to Trammell, who has been treated slightly better but has earned nowhere near the level of support the quantitative analysis would suggest, maybe it’s some strange prejudice against Detroit. In any case, this is one of the more remarkable divergences between quantitative and qualitative analysis in the history of the Hall, and I admit to being totally on the quants’ side on this one. Whitaker was a wonderful player who belongs in the Hall and with any luck will be installed by some iteration of the veterans committee. But it is not his absence that is outrageous; it is the failure of the BBWAA to consider him even worthy of consideration. Let’s return for a moment to our discussion in Part 1 of the bias of WAR for longevity. The career stat, as I mentioned, is basically an adding machine. A vastly complicated series of calculations and adjustments reduces everything to a single number per season — let’s say these inscrutable calculations produce four wins above your average replacement player for our guy in a particular season. And let’s say his number is somewhere around there for much of his career. His total WAR will be largely a function of how many years he plays. JAWS attempts to mitigate the longevity bias by averaging the career WAR total with the seven-year peak WAR total, but the poor standing of Sandy Koufax in the JAWS rankings demonstrates that peak WAR’s mitigation of the longevity bias is insufficient. So let’s try something else. Let’s eliminate longevity as a factor altogether and see what happens. It’s easy enough to do. Take a player’s career WAR total and divide it by the number of years he played, yielding his average single-season WAR. And let’s establish a minimum 10 seasons, since that’s required for consideration for the Hall. This list is quite different. In effect, we have gone from asking “Who was responsible for the most career wins,” a volume stat, to “Who was responsible for the most wins per year,” a pure performance stat. Suddenly, all the best second basemen in history didn’t play 100 years ago. Why is that? Well, the guys who played 100 years ago played longer and benefited more from WAR’s longevity bias. Hornsby played 23 seasons; Collins, 25; Lajoie, 21. The principal reason Morgan gets up there with these golden oldies is that he played 22. By failing to adequately mitigate this bias, JAWS reinforces it. You will note that Biggio and Kent both benefit from the longevity bias. Their per-year averages drop them from 14th to 20th and 18th to 21st, respectively. Whitaker is a better player than both by both measures. A key factor here is defense, where both Biggio and Kent are rated below average. That’s a pretty important fact to know about a second baseman. Whitaker’s career defensive WAR, as mentioned, is 15.4. Kent’s is -0.7, Biggio’s -3.9. The result of this analysis is that I changed my mind about both Biggio and Kent. I voted for Biggio in each of his first two years on the ballot. I wanted to vote for Kent last year, his first, but, like this year, ran into the problem of more worthy candidates than votes, so I didn’t. This year, I won’t be voting for either, which reduces my list of candidates to 13. That doesn’t mean I won’t go back to voting for them at some point in the future when the ballot backlog clears. This year, having more worthy candidates than votes, I don’t have to reach the ultimate question of whether they belong. I only have to reach the conclusion that there are 10 candidates more deserving of my votes. Anomaly No. 2: John Smoltz. With a 7.6 deficit to the average JAWS score of starting pitchers in the Hall of Fame, Smoltz would be eliminated from consideration fairly quickly if you accept this result. So I go back to my litmus test for this tool as it applies to starting pitchers. Koufax has a deficit of 14.3 to the average JAWS score of starting pitchers in the Hall of Fame. This fact by itself is enough to marginalize JAWS for me in the examination of pitchers. Koufax suffers, of course, from the longevity bias in both WAR and JAWS. He pitched only 12 seasons, and half of those were unremarkable. Kevin Appier, who pitched 16, is 13 places ahead of Koufax in the JAWS rankings. If I had been Jaffe while he was developing this system, I would have looked at this result alone and seen that I was failing to adequately mitigate WAR’s longevity bias. But quantitatively-oriented minds may simply see Koufax as an outlier who cannot be accounted for by any formula. Even when you eliminate longevity as a factor, the result in Koufax’s case is puzzling. He has a career WAR of 49, which gives him an average for each of his 12 seasons of 4.1. Forget all the categories in the WAR formula, forget all the math, and just ask yourself: If you put Joe Blow average pitcher out there every fourth day in Koufax’s place, he’d win four fewer games over the course of a season? Really? Well, yes, because Koufax doesn’t begin to assemble WAR of any kind until his career is half over. We forget that he was a quite forgettable young hurler in the late 1950s. Koufax’s peak, among the most brilliant in the history of the game, was only six years long. He was an all-star in all six after never having been one before. He won three Cy Young awards and finished third for a fourth. He received MVP votes after all six campaigns, winning it once and finishing second twice. Now get this: Koufax loses 4.2 career WAR — or the equivalent of a full season — because he was a lousy hitter. Seriously. But even eliminating that silliness, he accumulated 88 percent of his career WAR over the final six seasons of a 12-year stay in the big leagues. If you calculate his average annual WAR over those six seasons, it’s 7.8, which is more like it, although I’m still not sure the formula is adequately valuing him. In 1963, when he wins both the Cy Young award and the MVP, he’s 25-5 with an ERA of 1.88. His WAR that year is 10.7. So if the Dodgers had sent Joe Blow average pitcher out there in his place that year, Joe Blow wins 14 games? Really? Jim O’Toole and Bob Friend tied for ninth winningest pitcher in the National League that year with 17. Fourteen wins is a pretty good year for Joe Blow. Anyway, when you take the skepticism for JAWS you have learned from the Koufax case and apply it to Smoltz, you see quite quickly why the formula values him so much lower than it values his former teammates, Maddux and Glavine. Smoltz had a five-year stretch right in the middle of his career in which he started only five games. He missed all of the 2000 season following Tommy John surgery and returned in 2001 as a reliever, although he got all five of his starts between 2000 and 2004 that year. In 2002, he saved a league-leading 55 games and finished third in Cy Young voting and eighth in MVP voting. His WAR that year was 1.2. So presumably Joe Blow saves 54 of those games. I tell you one thing I’m learning here: I’m grabbing Joe Blow in the Rule 5 draft at the first opportunity. Because of his unusual double as one of the best starters and one of the best closers of his time, Smoltz really has only one comparable, and that’s Dennis Eckersley. Eck spent about half his career in each role. He was a pretty good starter, getting double-figure wins 10 times and winning 20 once, but not as good as Smoltz. He was a better closer by volume because he did it so much longer, but it’s hard to beat what Smoltz did in those three seasons on a qualitative basis. Eck, who is in the Hall as a closer, trails Smoltz in career WAR, 66.5-62.5. Smoltz is the only player in baseball history to amass at least 200 wins (213) and 150 saves (154). Eckersley fell three wins short of 200. I have not done exhaustive research on this, but so far as I can tell, Smoltz is the only player in history to have led his league in both wins (twice) and saves (once). For the 11 seasons before his injury, Smoltz averaged 3.95 WAR per year, including 7.3 in 1996, when he won the Cy Young award and went 24-8. So presumably Joe Blow wins 17 that year; I totally want to sign this guy. Smoltz’s annual WAR as one of the best closers around are 1.2, 3.3 and 2.2. If you bump these up to the average he’d established prior to that, he jumps up the JAWS rankings to the Bob Feller, Roy Halladay neighborhood, and now he’s a serious candidate even by JAWS standards, although he still has a deficit to the average JAWS score of pitching Hall-of-Famers. When he returned to starting at the age of 38, he put up consecutive annual WARs of 4.9, 5.9 and 4.6. If you give him that annual average during his three years as a closer — 5.1 — he improves his standing further. At some point, you get lost in this hypothetical math, so I’m going to stop. Bottom line: In my opinion, WAR and JAWS are inadequate to account for an anomaly like Smoltz. To my subjective eye, he was every bit Glavine’s equal, if not quite Maddux’s, and held his own very nicely in that select company for many years. He was a wonderful starter, a wonderful reliever and a superb postseason competitor (15-4, 2.67). I’m voting for him. Anomaly No. 3: Larry Walker. I admit I bring a clear bias to this part of the conversation, but I contend that my bias is largely a reaction to the bias of most baseball writers and analysts not located in the Rocky Mountains — meaning all but about a dozen of them — against performances put up at Coors Field. Everybody knows it is the park that produces the biggest offensive numbers most of the time, therefore those numbers have to be discounted. Which is where all these advanced metrics come in, right? They do that. They adjust for ballparks. So that should take care of it. According to JAWS, Walker is the 10th best right fielder in baseball history. The nine ahead of him are all in the Hall of Fame. Three of the four immediately behind him are in the Hall. If he were inducted tomorrow, his JAWS score would be slightly above the average of his new peer group. And yet, he’s getting barely cursory consideration from Hall voters. Last year, he finished 19th of 36 candidates. One in 10 voters checked him off. I’ll be honest: I don’t know how to compensate for the effects of Coors Field. I’m not that into the mathematics of baseball. So I accept the ballpark adjustments the sabermetricians make. I don’t know exactly what they are, but this is what they do, right? They take the above-average offensive output at Coors and they multiply performances there by some factor to normalize them. I assume this is what they do. So once Walker’s traditional stats have been put through these various wringers to produce his WAR and JAWS numbers, why don’t they count? Why don’t most of the voters take him as seriously as his JAWS score suggests they should? Having spent quite a bit of time in press boxes during my days as an active BBWAA member, I would say this is because of a sort of sneering, smirking prejudice against Coors Field and Colorado and anything done here — yes, I’m writing from elevation, and no, I can’t seem to throw a breaking ball — on the part of most baseball writers. A lot of them honestly don’t think, even after 22 years, that Denver is a suitable place for big league baseball. The game is too weird here, not real, not legit. If you cheer for the Rockies, you may feel the same way. Based on that 22-year data set, there are statistical anomalies here that are really discouraging with respect to the home team’s chances of sustained success. Pitchers blow out here, both physically and mentally. No good pitcher in his right mind wants to pitch half his games here. The few pitchers who experience success here can’t sustain it. No pitcher has won 100 games in a Rockies uniform. No pitcher has won 80. So elevation is a big issue in terms of the team’s ability to compete. But if the math can adjust for the outsized numbers put up here, why should a player of Walker’s quality be penalized for playing much of his career in a place the snobs of baseball don’t take seriously? Here’s something the discounters don’t pay enough attention to know: Rockies hitters traditionally struggle when they head out on the road after a homestand because they have to readjust to the sharper bite of breaking balls and sinkers again. So while it is true that their offensive output at home is exaggerated by the Coors Field effect, their offensive output on the road is also depressed by it; hence the dramatic home/road splits that critics attribute entirely to the magnification at home. The road numbers are the “real” numbers, they say. They consistently fail to acknowledge the established phenomenon of the destructive effect each and every time hitters return to sea level. Back in the day, Dante Bichette brought a “curve ball machine” on the road with him in an attempt to reacclimate. An inventor in Greeley, Colorado has proposed a pressurized batting cage in which the Rocks could work against pitching in normal (read: sea level) atmospheric conditions in preparation for each road trip. There is no adjustment for this phenomenon in the advanced metrics that I know of. Walker’s numbers at Dodger Stadium would be adjusted for the park in the same way as everybody else’s, even if he’s coming from a mile-high elevation and experiencing a phenomenon that only his teammates face. Walker got MVP votes after eight seasons, winning the award in 1997. He batted .384 at Coors that year, but he also batted .346 on the road. He hit 29 of his 49 homers on the road. In “late and close” situations, baseball’s measurement for clutch, he hit .352. Heck, he batted .322 in 1994 playing his home games in Montreal’s ghastly Olympic Stadium. He was a marvelous outfielder with a terrific arm and one of the best baserunners of his generation. He played an all-out style that produced various injuries that hurt his volume numbers, but he still overcomes the longevity bias of both WAR and JAWS. He and Harry Heilmann played the fewest seasons (17) of anyone in JAWS’s top 10 right fielders. His JAWS score is better than that of Hall-of-Famers Paul Waner, Sam Crawford, Tony Gwynn, Dave Winfield and a bunch of old-timers you may not have heard of. Gwynn, you may recall, was elected to the Hall on his first try, with 97.6 percent of the vote. According to the eye test, Walker was an obvious Hall-of-Famer when healthy, a five-tool player who simply played the game at a higher level than everybody else. But there was always that sneaking suspicion about the enhancing effect of Coors Field on his numbers, that those three batting championships, that incredible run of six seasons — .366, .363, .379, .309, .350, .338 — was some sort of mirage. I voted for him his first two years on the ballot based on my subjective view of his talent, but I left him off my ballot last year when there were so many deserving candidates. I’m grateful for the sabermetrics here because I didn’t know how to adjust for the Coors Field factor and they do, or at least they think they do. The quantitative analysis says Walker was one of the best right fielders ever to play the game. And here’s the important point: The quant analysis says he is the best right fielder in history who is not in the Hall of Fame. The privilege of watching him every day produced the same conclusion from the eye test. In this case, it seems to me, the quantitative analysis finds a great player and the qualitative analysis of most writers is buried in prejudice and ignorance about Colorado and Coors Field. With my subjective view reinforced by the quants, I will not only vote for Walker this year, I will reserve one of my votes for him for as long as he is on the ballot and I have the privilege of voting. These are the most interesting and/or difficult issues I wrestled with this year. According to JAWS, neither Tom Gordon nor Lee Smith meets the standard of an average Hall of Fame relief pitcher, and subjectively, I agree. As we’ve seen in Smoltz’s case, advanced metrics have difficulty valuing closers. It’s ridiculous, in my opinion, to suggest that a top closer means only one or two wins a year over an average closer, but I sympathize with the difficulty of the task. It’s such a specialty, it’s a little like a kicker in football, and those guys don’t generally make the Hall of Fame, either. Eliminating Biggio, Kent, Gordon and Smith gets me down to 11, and there I’m stuck. I would vote for all remaining 11 if I could. And who knows, if I had more votes I might vote for Biggio, Kent and Gary Sheffield, too. As I mentioned earlier, I never reached that point because I knew I didn’t have enough votes. Because of the logjam when Maddux, Glavine and Thomas hit the ballot last year, I didn’t vote for either Curt Schilling or Mike Mussina, having voted for Schilling the year before. But after studying their numbers, both advanced and basic, my subjective view that they are qualified was confirmed, Schilling, frankly, more so than Mussina because of the unbelievable postseason record. But, in examining my eye test on these guys, I had to admit to a personal bias against Mussina because he left the Orioles as a mercenary and signed with the Yankees. I hate players who do that within a division because it makes the smaller market team look like part of a feeder system to the bigger market team and undermines the illusion of competitive balance. Mussina went for the money and the improved chances of a championship on a team willing to field the best players money could buy. Do you believe in karma? The Yankees won a championship the year before he arrived, in 2000, and the year after he retired, in 2009. But not during the eight years he was there. As Mel Allen used to say, how ’bout that. Still, he gave the O’s 10 good years and they had losing records his last three seasons there. I still don’t forgive him for the treachery of signing with the Yankees. He could have gone anywhere else without seeming to throw over his girlfriend to go date the richest girl in school. I still haven’t forgiven Reggie Jackson, either, and he spent only one season with the Birds, biding his time until free agency. If anyone was ever meant to play in New York, it was Jackson, but I still have the SI cover with him in an Orioles uniform. He looked good. But I digress. I will vote for Mussina and his 270 wins and 3.68 ERA and JAWS score slightly above average for Hall of Fame pitchers. Schilling, of course, was obtained by the Orioles in a great trade — from the Red Sox, who drafted him, along with Brady Anderson, for Mike Boddicker — and then shipped out in one of the worst trades of all time — with Steve Finley and Pete Harnisch, for Glenn Davis. This is not relevant to the discussion in any way; just thought I’d mention it. Davis played 185 games over the next three seasons and retired. Schilling, Finley and Harnisch all went on to have long, productive careers. JAWS says Schilling is better than the average pitcher now in the Hall, and I know he was better in the postseason, when he went 11-2 with a 2.23 ERA. In the World Series, he was 4-1, 2.06. Randy Johnson and Pedro Martinez are no-brainers I won’t dwell on. Johnson is one of 24 pitchers in history to win at least 300 games (303). He led the league in strikeouts nine times, won five Cy Young awards and finished second for three more. He had records like 18-2 in 1995 and 20-4 in 1997 for the Mariners, 21-6 in 2001 and 24-5 in 2002 for the Diamondbacks. At 6-10, the Big Unit and his unwinding windup were unique. Martinez won three Cy Young awards, finished second for two more and won five ERA titles with these numbers: 1.90 (Montreal, 1997), 2.07 (Boston, 1999), 1.74 (Boston, 2000), 2.26 (Boston, 2002) and 2.22 (Boston, 2003). That year in between titles in Boston? He sagged to 2.39. From 1997 to 2000, there was nobody better, not even Johnson. I’m voting for Piazza and Bagwell on the same basis I voted for them last year — their numbers obviously qualify them and I don’t have enough evidence of cheating, despite the rumors that followed them, to disqualify them on that basis. Piazza is the fifth-best catcher in history, according to JAWS, better than Yogi Berra and Bill Dickey and Mickey Cochrane. The only catchers who score better are Johnny Bench, Gary Carter, Ivan Rodriguez and Carlton Fisk. Bagwell is the sixth-best first baseman of all time, JAWS says, better than Frank Thomas, elected on his first try last year, Eddie Murray and Willie McCovey, Hall-of-Famers all. I’m voting for Raines and Trammell, as I have consistently, in declining hope that advanced metrics will make more voters wake up to how good these guys were. The persistent and determined undervaluation of Trammell and Whitaker remains a mystery to me. Maybe it’s a Detroit thing. Been a while since Al Kaline and Sparky Anderson. Trammell has a better JAWS score than Derek Freaking Jeter, who will be serenaded into the Hall on a bed of rose petals at the first opportunity. Trammell was not as good an offensive player, although a lifetime average of .285 with 185 homers ain’t too shabby for a shortstop, but he was a much better defensive player at arguably the most difficult defensive position in the game. Trammell’s career defensive WAR is +22. Jeter’s is -9.7. Raines’s JAWS score justifies his election, too. He’s the eighth-best left fielder in history, according to JAWS, and the only ones above him not in the Hall are Bonds and Pete Rose. He was also the best base-stealer I ever saw. He finished fifth all time with 808, but the amazing part was his percentage. He was successful 85.7 percent of the time. Only Carlos Beltran, who tried less than half as often, has a better rate. As with Trammell, I am encouraged that advanced metrics bolster Raines’s case, but doubtful that my colleagues in the BBWAA will see the light in time. The new rule allowing candidates to remain on the ballot only 10 years instead of 15 will hurt Raines more than anyone else. He has three years left instead of eight, in the midst of the current wave of superstars becoming eligible. Trammell was grandfathered into the 15-year stay, but has only two of them remaining. The both deserve inclusion, as the advanced metrics confirm, but they will have to rely on the kindness of the veterans committee. So that leaves Edgar Martinez as the odd man out. I wish I could vote for him. I voted for him last year. He was a lifetime .312 hitter, a two-time batting champion, one of those guys who was born to hit a baseball. Unfortunately, there is also a major weakness to his game, which is defense. He was a sub-par defender when he played third for the Mariners and then he played no defense at all in 68 percent of his games, which is not an insult but a fact. He became a designated hitter. That didn’t keep me from voting for him last year, and it won’t in the future when the logjam clears, but it’s the distinguishing factor among worthies that takes him off my ballot this year. In the end, even with the criticisms I’ve expressed about JAWS, I end up with only one change from the JAWS top 10 of this year’s class of eligibles after my exclusions for obvious cheating. I remove Edgar Martinez and add John Smoltz. 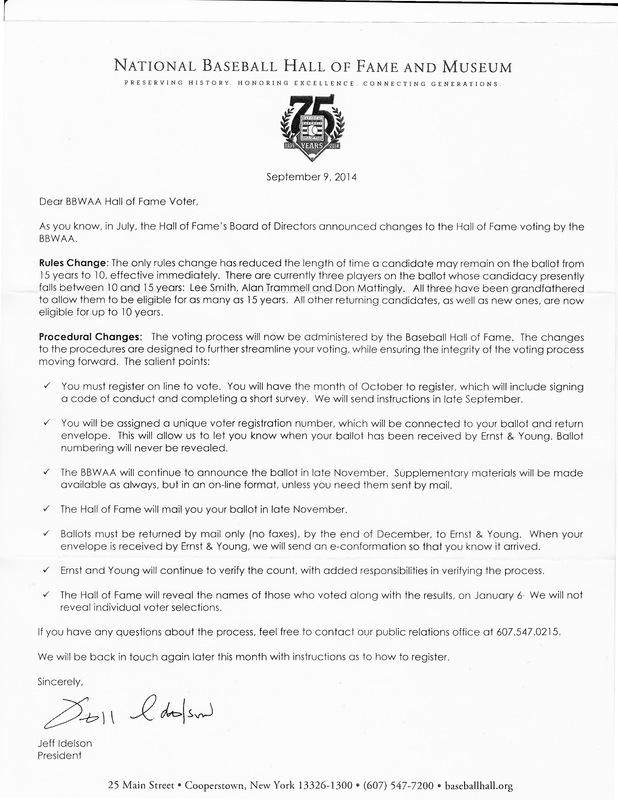 In my snail mail this week was a letter from the Baseball Hall of Fame dated Sept. 9, reproduced above, in which it outlined changes in voting procedures beginning with this fall’s balloting for the class of 2015. The two biggest changes are the length of time a player may remain on the ballot (down to 10 years from 15) and administration of the voting, which is being moved from the Baseball Writers Association of America to the accounting firm Ernst & Young. Three players already beyond their tenth year on the ballot have been grandfathered in and will remain on the ballot for 15 years, assuming they aren’t elected prior to that — Lee Smith, Alan Trammell and Don Mattingly. The one quibble I have with this transition is the effect it has on players nearing the new 10-year limit, namely Mark McGwire and Tim Raines. McGwire, in his ninth year on the ballot, will actually be kicked off before Smith, in his 13th. That doesn’t seem right. The timing of the changes is especially unfortunate for Raines, who was making steady progress, from 24 percent of the vote in 2008 to 52 percent in 2013. In a four-year period, from 2013 through 2016, an unusually star-studded wave of newly-eligible players came along — Craig Biggio, Barry Bonds, Roger Clemens, Mike Piazza, Curt Schilling and Sammy Sosa in 2013; Tom Glavine, Jeff Kent, Greg Maddux, Mike Mussina and Frank Thomas in 2014; Randy Johnson, Pedro Martinez, Gary Sheffield and John Smoltz in 2015. The wave culminates with Ken Griffey Jr. in 2016. Under the old rules, Raines might have ridden out this wave and then resumed his assault on a Bert Blyleven-like renaissance near or at the end of his eligibility. Cutting his remaining eligibility in one fell swoop from eight years to three dramatically reduces the possibility of his being elected. As a Raines voter, I can only hope some version of the veterans committee rights this wrong in the future. The rest of the procedural changes are mainly to bring more seriousness to the voting process after last year’s instance of an eligible voter offloading his vote to ineligible voters. Whatever you think of the voting bloc, it is to be expected that the Hall would want to control who gets to vote. Commitment to a code of conduct will now accompany voter registration. The process is brought into the electronic age with online registration and research materials but remains in the Pony Express days with actual submission of ballots by snail mail. The Heisman Trophy has had electronic voting for some time now, so I assume Ernst & Young will ultimately employ this innovation as well. But not yet. From the standpoint of voters, the new procedure offers the innovation of confirming receipt, never before available because the BBWAA didn’t open ballots until it was time to count them, by which time it would be too late to replace a ballot lost in the mail anyway. There is no change to the much-discussed limit of 10 votes per voter. Many voters expressed regret that they could not vote for more than 10 last year. I was one of them. I left Curt Schilling and Mike Mussina off my 2014 ballot because I was not willing to abandon candidates I had supported longer — including Raines, Trammell and Jack Morris. The 10-year eligibility limit will turn over the names more quickly, reducing this ballot congestion problem to some extent, but off the top of my head I can name more than 10 players I’d like to vote for this year. Here’s a look, courtesy of Baseball Reference, at 2015 eligibles. I should start by admitting that I am the worst kind of voter for the Baseball Hall of Fame, at least according to the modern reformers. I am an “honorary” member of the Baseball Writers Association of America rather than an “active” one. In fact, I’m still as active as ever, although that’s not a particularly high standard. My BBWAA category changed because my employer changed. I’m still in the media and I still cover baseball, so this is mostly a reflection of the ambiguities of a modern media landscape in transition. Here’s how it happened: I was an active member while covering baseball as a columnist for the Rocky Mountain News and Denver Post. When I moved to KOA radio two years ago, I told the BBWAA I would still be attending Rockies games on a media credential from time to time and writing about baseball in my new blog. As many bloggers will tell you without prompting, that is not enough to make you an active member. I remain an honorary member only because I had the requisite ten years or more as an active member. The reason that many who advocate reform of the voting process object to honorary BBWAA members voting for the Hall is the category includes retired writers who may or may not keep up with the game. Of course, Hall of Fame voting is all about the past — a player must have been retired for five years to be considered and can remain on the ballot for fifteen years after that — so retired voters are often passing judgment on players they watched or covered at one time. But I’m not retired yet so I’ll let those folks carry their own water. 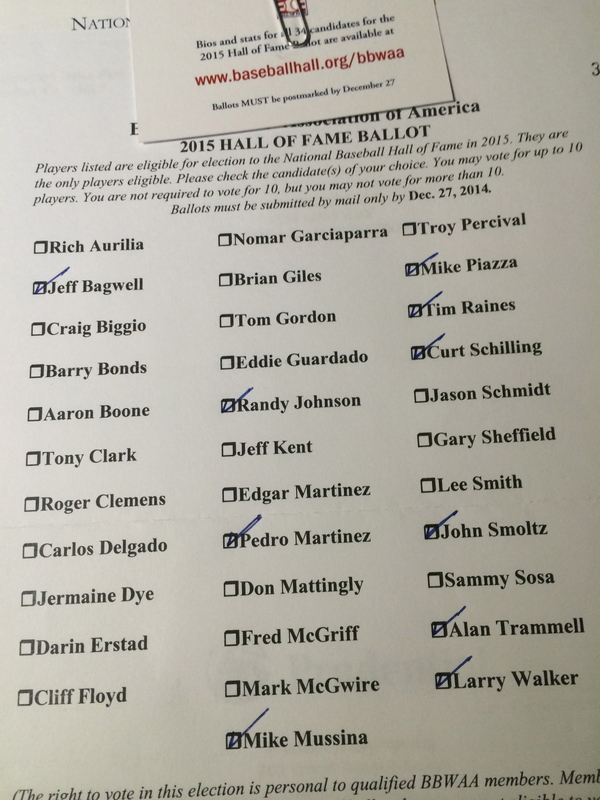 The Hall of Fame ballot, as you are probably aware, has become more contentious than ever. There were always disputes, of course; fans have passionately argued their differences of opinion for as long as I can remember. I still engage in the Roger Maris argument every now and then. Whether the Hall was essentially a lifetime achievement award or a recognition of true brilliance, even if short-lived, was the most common area of disagreement. Sandy Koufax made it, but generally speaking, the lifetime achievement award won out. Career statistics, including volume statistics that rewarded longevity more than brilliance, became the standard measuring stick. Then came sabermetrics and a new divide. Older baseball writers were slow to adopt the Bill James template of advanced metrics; a younger generation embraced it. Older writers tended to think the false precision of new metrics allowed those who had never covered the game or talked to players or managers to believe they had a better understanding of it than those who had. Younger analysts often thought those who rejected or ignored the new metrics were allowing anecdotal recollections and inferior statistical measures to stand in for better, more modern rulers. Jack Morris is the personification of this divide. Many of us considered him the dominant pitcher of the 1980s and remember his signature moment in the 1991 World Series – a 10-inning, 1-0 victory in Game 7 – as the very definition of greatness, of rising to the biggest occasion. Many sabermetricians look at his career numbers and say he’s not even close to Hall-of-Fame worthy. Then came steroids and a divide that allowed an unbecoming sanctimony to emerge on both sides. Let’s call it a divide between the moralists and the moral relativists, to use allegations that both sides like when they’re about the other side and neither side likes when they’re about them. I’m not that fond of either characterization. I look at the emotionalism in our politics, at people whose minds are closed by ideological bias and go to name-calling as a first resort, and I admire those in the middle taking arrows from both sides while trying to solve complex problems that don’t lend themselves to the solutions of sloganeering. That’s sort of where I am — in the muddy middle — with respect to the Hall. In my opinion, there is no question that the game was changed more dramatically by the illegal use of steroids and human growth hormone than any form of cheating that came before. For those who claim these drugs are really no different from greenies, Tom Verducci of Sports Illustrated points to the rather large difference in baseball’s penalties for a first offense between the two categories of drugs (“mandatory evaluation” and follow-up testing for amphetamines; 50-game suspension for steroids and HGH) as a measure of their relative impact on the game. The top six single-season home run totals in baseball history all happened in a four-year span, from 1998-2001, at the height of baseball’s steroid era. For a game that’s been played for more than a century, that’s quite a coincidence. It is true, as the critics of “moralist” voters suggest, that baseball’s ambivalence on the subject of steroids is a complicating factor. Coming out of the 1994-95 strike, commissioner Bud Selig was only too happy to see the home run race of 1998 bring fans back to the game. Many of the BBWAA’s critics wonder why writers are trying to enforce a Hall of Fame penalty for activities baseball didn’t even prohibit through collective bargaining until the 21st century. Selig, who now condemns PEDs with the zeal of a religious convert, claims the failure to prohibit their use before that was all the union’s fault. It is true that union chief Donald Fehr might have succeeded in blocking an all-out push for reform by Selig, but Selig never made one, whatever he says, so we’ll never know. In any case, having or using steroids without a prescription has been a federal crime since the early 1990s, so PED users were on the wrong side of the law even if the commissioner remained oblivious, as he claims. The involved and complex ways they went about keeping their use a secret make it clear they knew on some level what they were doing was wrong, or at least prohibited. Just as important to some of us who followed the game for many years was the distorting effect PED use had on the game’s historical record. Baseball’s blind eye allowed players to obliterate records established without the use of PEDs and to be rewarded and glorified for it. Consider the difference between what happened to Lance Armstrong, the disgraced cyclist subject to the enforcement mechanisms of the U.S. Anti-Doping Agency, and Roger Clemens, subject to the non-existent enforcement mechanisms of major league baseball. Armstrong has been stripped of his titles and is now subject to a variety of civil lawsuits based on taking money under false pretenses. Exclusion from the Hall of Fame is the only penalty Clemens may face, and even that is not certain. There is a feeling among many older voters who covered great players before the steroid era that somebody has to stand up for them and the records they established. If you want to know how some of these existing Hall of Fame members feel about steroid users being enshrined, just ask them. So I don’t vote for otherwise worthy candidates for whom it seems to me there is more than adequate evidence of PED use on the public record. Game of Shadows, the excellent investigative book by Mark Fainaru-Wada and Lance Williams, provides this evidence in the case of Barry Bonds. The public record of Clemens’ trial on perjury charges, including the detailed testimony of trainer Brian McNamee, provides it for Clemens. I understand he was acquitted. Given the standard of proof in a criminal proceeding – beyond a reasonable doubt – I understand how the attack on McNamee’s credibility by Clemens’ able legal team produced that result. To quantify “beyond a reasonable doubt,” I think of a standard of 85 percent or 90 percent certainty. The standard required to convince me of any given proposition is more like the civil standard of “preponderance of the evidence” – something greater than 50 percent. In the case of Clemens, the government’s case and McNamee’s testimony get me past that threshold easily. The performance of Mark McGwire and Sammy Sosa before Congress – one wouldn’t answer questions about PED use, the other temporarily forgot how to speak English — and Rafael Palmeiro’s failed test do the same. On the other hand, I do vote for otherwise worthy candidates about whom it seems to me there is little more than unsubstantiated allegation and innuendo with respect to PED use. It’s an imperfect, subjective standard, I admit. But given the history, and baseball’s abject failure to police itself during this period, it is the best I can do. I have little sympathy for the argument that since we don’t have perfect knowledge, we should give up and let ‘em all in. As someone who made a living as a journalist for most of my career, I know I never had perfect knowledge. You acquire as much as you can and make judgments on that basis. It’s the best you can do. I’m also not comfortable with a formulation that says we don’t have perfect knowledge, therefore keep anybody out who was ever accused of using steroids by anyone. Adopting standards for the credibility of information is at the very heart of what journalists are supposed to do. 5. Voting – Voting shall be based upon the player’s record, playing ability, integrity, sportsmanship, character, and contributions to the team(s) on which the player played. These are not my rules, but if I agree to be a voter, I agree to abide by them. It seems to me obvious that people who cheated and lied about it in ways that glorified themselves, disadvantaged competitors who didn’t indulge and distorted the game itself were not exemplifying integrity, sportsmanship or (good) character and are therefore missing three of the six stated criteria for election. It is not the voter bringing morality into the conversation, it is the Hall and the rules it asks voters to respect. I understand there are people already enshrined who may not have met these criteria. I do not agree that this justifies ignoring the criteria now. If the Hall wishes to eliminate these considerations, it can do so at any time. Until then, I’m including them in my deliberations, as I’m instructed to do. This year, there is an additional, rare complication, which is that there are too many worthy candidates to fit under the limit of ten votes each voter is permitted to cast. Had I been able, I would have voted for more than ten this year. But since I couldn’t, I allowed a very practical consideration — time on the ballot — to influence me. There are first-time nominees I didn’t vote for that I expect to vote for in the future. But, for example, I was not going to abandon Morris in his final year of eligibility in favor of a first-year nominee who would have won a head-to-head competition in my head. I realize that might make some people’s heads explode, but since I have already admitted to being an honorary voter, I’m guessing this will come as no great surprise. So, anyway, here’s my ballot. Happy new year.